Casa Rosina is a haven of peace and tranquility set in a hamlet only 5 kms from the white village of Periana and a 10 minute drive from Alcaucin. It is one hour's drive from Malaga and located along an easily accessible track. The house is full of character with traditional features including wooden beams and shutters and terracotta tiled floors. With its own private pool and BBQ area, the front and back sun terraces offer stunning open views to the mountains, lake Viñuela and Mediterranean sea. The well-made track to the house winds its way through olive groves, assorted fruit trees and wild flowers. The fascinating Moorish cities of Granada, Cordoba and Sevilla are all in easy reach by car. The coast is only a half hour drive with many beaches and coves and small towns to explore. The four bedroom house (210 sq m), has a plot of 2000 sq m land comprising 25 olive trees which the present owners have harvested by a local artisan oil producer. The land is a 5 minute walk from the house. The main door opens into the large sitting room which also has space for a dining table and chairs. The wood burning stove heats the ground floor and upstairs main bedroom. Off the sitting room are 2 twin/double sized bedrooms and the lower ground floor has a large bedroom which has its own kitchenette and shower room with toilet. The fully fitted kitchen leads to the utility room and out to the pool terrace and swimming pool (2.5 m x 6.5 m). There is a 3000 litre water deposito under the pool to ensure a good supply of water. A beautiful fig tree gives the most welcome shade to the pool dining terrace in the heat of the summer. The stairs to the upper floor lead from the kitchen. The very spacious main bedroom, TV snug and large family bathroom are located on the upper floor. The front of the house has stunning views down the mountain side to Lake Viñuela and the Mediterranean Sea and the rear of the house and pool terrace look up to the mountains behind. It is a very private house and despite having a house on either side is not at all looked over. Casa Rosina has been let out for short holiday rentals over the past 15 years and is being sold fully furnished. 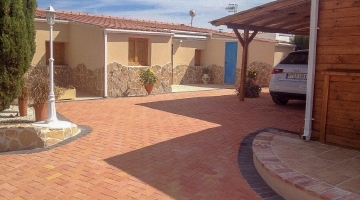 It has provided a good income for the present owners and could be bought as a holiday home for the new owners with the ability to let out for the times they do not wish to stay in the house. Equally it could make an excellent home for a family or couple with plenty of space for family and friends to stay.